A number of members underlined the importance of using flexibilities to increase access to health products included in the World Trade Organization Agreement on Trade-Related Aspects of Intellectual Property Rights (TRIPS), such as Russia, which cited compulsory licences, Zimbabwe, Bangladesh, India, and Ecuador. The United Kingdom also mentioned the use of TRIPS flexibilities for health emergencies in developing countries. Zimbabwe voiced “great concerns” at the limited progress on access to safe medicines and vaccine in most developing countries. The draft roadmap, the delegate said, should have more emphasis on public health approach of TRIPS flexibilities. WHO should take the lead in raising awareness at country level about the importance of TRIPS including the provision of technical support. The United States, a Board member, however said several deliverables of the draft roadmap stand outside WHO’s mandate, in particular on intellectual property and international trade. The US delegate suggested revising the roadmap to revise such deliverables, and concentrating on the collaboration with the WTO and the World Intellectual Property Organization on IP and trade issues. Mariângela Batista Galvão Simão, assistant director-general for Drug Access, Vaccines and Pharmaceuticals, said since the adoption of TRIPS in 1996, WHO’s mandate has included work on the agreement, and several WHO resolutions have been adopted in subsequent years,. What WHO does on IP is reported to the Council for TRIPS every year, Simão explained. Reports from 2000 to 2018 to the TRIPS Council are available online she said, and reflect the trilateral collaboration, including a yearly meeting with the heads of agencies. Canada, a non-EB member, in its statement [pdf] said they welcome the WHO/WTO/WIPO collaboration in particular on intellectual property, trade, access to medicines, and public health, as it is important to leverage the respective IP-related technical expertise of WTO and WIPO to inform the WHO’s work on access to medicines and vaccines, and avoid a duplication of work. In response to questions by WHO members, Singh said that the TRIPS flexibilities are already mentioned in deliverables of the roadmap, even though some countries would prefer more focus on them. The high price of medicines was widely pointed out as a barrier to access to medicines and other health products during the discussion yesterday, whether it was mentioned by EB members or non-EB members, developed or developing countries. Romania on behalf of the European Union members advocated for a holistic approach including fair pricing and transparency. Italy called for “any instrument deemed appropriate” to address the issue of access to health products, and voiced interest for a WHO resolution on transparent pricing of medicines at the next WHA. Chile, Bolivia, and Bangladesh called for price transparency, while Iran underlined the fact that there is no common definition of fair pricing among WHO member states. Indonesia, in its statement [pdf] advocated for global cooperation and cross-sectoral cooperation, and called for the development of an “effective, transparent and participatory mechanism for price negotiation and – or pooled procurement,” respecting laws and regulations of respective member countries. Indonesia also supported the establishment of a mechanism ensuring access to medical products, the delegate said. Ecuador underlined the monopoly of the pharmaceutical industry on some products and resulting high prices, and suggested limiting patent terms. The delegate also mentioned the issue of “new and very expensive medicines” which efficacy has not been demonstrated. India, a non-EB member, in its statement [pdf], called for shortages and access to medicines to be treated separately so as not to dilute the focus on access to medicines. The Indian delegate advocated for a de-linking of the cost of research and development from end prices, and suggested a special fund to advance R&D on medicines and vaccines on diseases mainly affecting low and middle-income countries. Besides prices, several issues were underlined in the broad problem of access to health products. Germany said it is hampered by legal and cultural barriers, while Sudan said the lack of robust health systems is a particular challenge for developing countries. Jamaica underlined the lack of access to HPV vaccine, and asked what was being done to remedy the high prices. “We have millions of women suffering from cervical cancer,” which can be prevented because the price is so prohibitive, the delegate said. She asked what lessons had been learned from the HIV/AIDS and how prices of antiretrovirals had been successfully brought down. 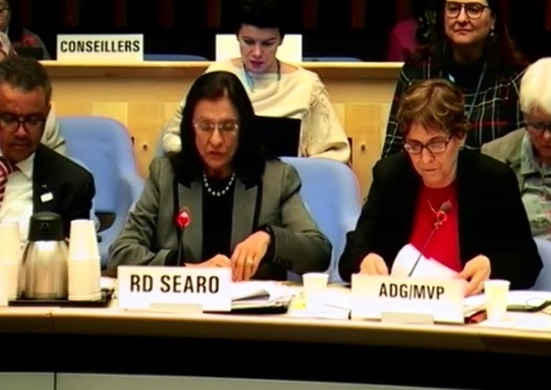 Simão responded the WHO is considering an additional candidate to the current prequalified products, which were not enough to cover the needs. The WHO is helping countries with price negotiations and approaches to procurement, but it remains a real concern, she said. The Sudanese delegate also underlined the issue of regulation surveillance of pharmaceutical products at the national and called for a regional level mechanism which could sanction falsified products. Falsified medicines are attractive because they are cheaper than the safety approved medicines, said the Djibouti delegate, adding that more and more falsified medicines are coming on the market. The horn of Africa lacks proper cross-border regulatory agencies, and WHO should help in establishing proper control measures. Community health workers could also raise awareness about the dangers of falsified medicines, the delegate said. A number of delegations asked about the funding of the draft roadmap and its deliverables, such as Romania for the EU, Canada, and the United Kingdom. Benin for the African region said the roadmap should have reference to needed resources, and India remarked on the lack of budget estimates associated with deliverables and timelines, as well as a breakdown of what will be done at headquarters, the regional offices and country offices. China said more indicators would be needed to measure progress in the roadmap. Several developing countries, such as Sri Lanka, underlined the need for support as countries transition out of support from institutions such as Gavi the Vaccine Alliance and the Global Fund for AIDS, Tuberculosis and Malaria. Support was also requested to strengthen regulatory authorities. Germany voiced concerns about procurement quality insured health products after countries transition out of support, and called for strengthening countries’ procurement capacity, and to include local production in the revised roadmap. Japan stressed the importance of strengthening national capacity in pharmaceutical regulation, which he said is part of the barriers to equitable access to medicines. There is a need to continue talking about the harmonisation of national regulatory authorities, the delegate said. Dr Tedros, answering countries said as it is not possible to have strong regulatory capacity in every country, it is important to have joint regulatory bodies. On access to medicines and quality, “we should not lose sight of what we can do today,” Dr Tedros said at the close of the discussion, remarking on the importance of pooled procurements creating economies of scale, citing the Pan American Health Organization example. He also suggested the strengthening of supply chains as a short-term measure to be taken to improve access to medicines and quality. "Board Debates Medicines Access; WHO Asserts Mandate On IP, Trade Issues" by Intellectual Property Watch is licensed under a Creative Commons Attribution-NonCommercial-ShareAlike 4.0 International License.